The Russian BTR-90 8×8 Wheeled Infantry Fighting Vehicle was developed in 1994, as of 2006 there are only a limited number of BTR-90’s in service with the Russian Ministry of Interior. It has a new hull which is bigger and has a distinctive arrow head front and seen the lose of the commander and drivers bullet proof windows as on other BTR’s. 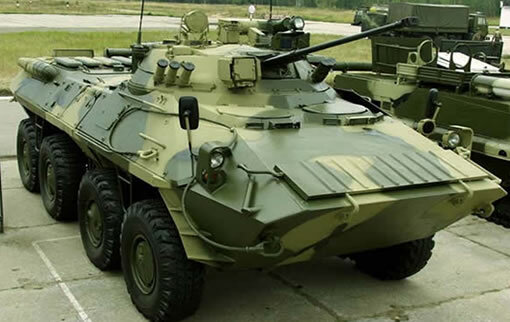 In October 2011 the Ministry of Defence refused to buy more BTR-90 and did not include them in the list of the state program of armament until 2020, and waived exports for the BTR-90. In July 2013, Russia revealed it had developed and tested a hybrid-powered silent armored personnel carrier that could be turned into an unmanned ground vehicle. Called the Krymsk, it is based on the BTR-90 and can move silently on a battery-driven electric motor when its diesel engine is turned off. The lay out of the vehicle is the commander (right) & driver (left) sit in the front. Behind them is the turret which is operated by a gunner. Behind that is the infantry troop compartment and the final section was the engine. The troops embark/disembark through a door between the 2nd and 3rd wheels. The door opens like a clam, the top opens upwards and the bottom drops down to form a step allowing the troops to exit with speed and avoid being crushed by the wheels whilst the vehicle is on the move. It’s most noticeable up-grades are the new armaments – the new 30mm auto-cannon as the main gun with a 75° elevation and the additional ATM launcher with a maximum range of 4000m. On the turret rear is a new 30mm grenade launcher. The armour is also up-graded and it has a new single multi-fuel engine generating 510hp. It has the standard crew lay out as other BTR’s and has the same amphibious and propulsion systems too. Pictures of a BTR-90 fitted with the BMP-3 turret and its associated weapons have also been published on the other online sources.